WOW – lots of creativity blended with a variety of colors in the shape of postcards flood the office. A big thanks to all those artists who submitted a fabric postcard(s) to be juried for the silent auction and/or the Michael Miller Fabric Challenge Contest. Every time a postcard entry arrived, it was the first envelope opened with lots of thrilled reviews. Challenge fabric entries often brought much joy and laughter for us — many artists took a whimsical approach while some added words and a “wink” to their art. 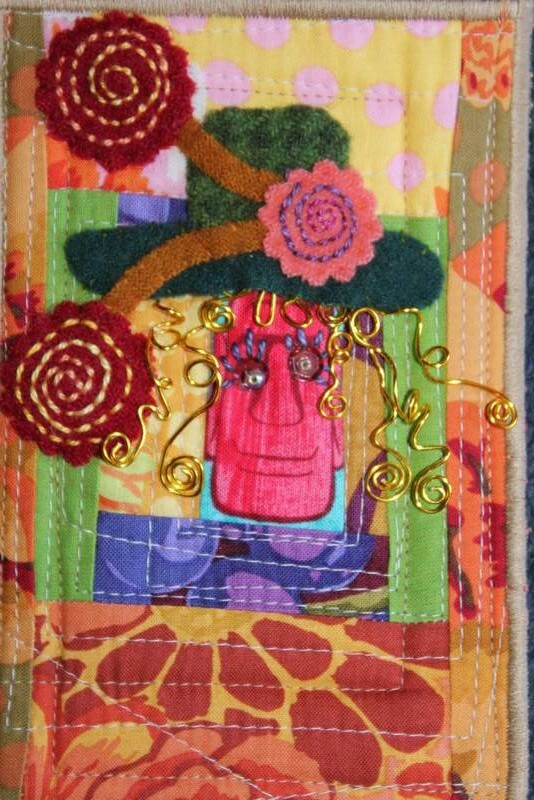 After all, with a challenge fabric named “Tiki Winki” how can it not conjure up creations that make you smile. Marion Shimoda’s first place Challenge card does just that. 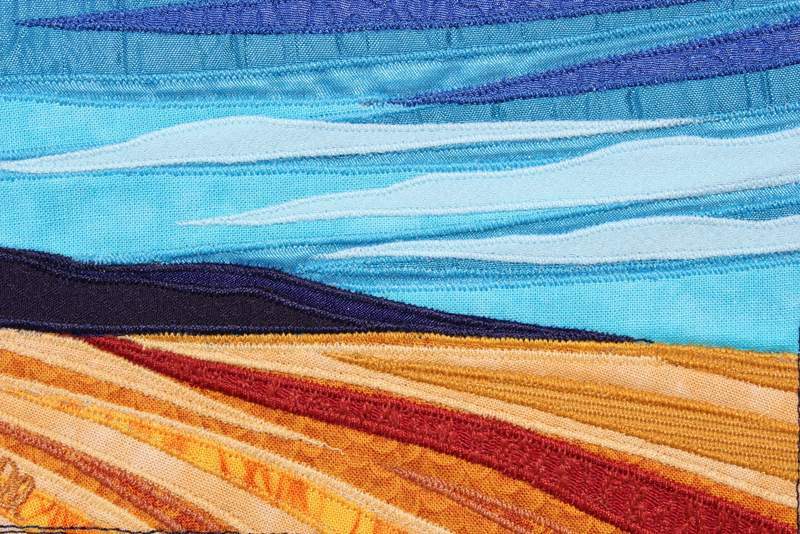 Kate Speckman, in second place created a serene view of paradise using the Challenge fabric in 25% of her creative piece but makes a relaxing statement. A modern art approach was taken by Kristin Shields for third place. To view all the Challenge winners visit us on Facebook –last 5 photos in the album. While you’re there, take a look at the fabric postcards for this year’s silent auction – a benefit for Wendy’s Wish. Incredible work from artists throughout the United States. For the folks who follow the local art scene here in Central Oregon, this year Lisa and Lori Lubbesmeyer entered a landscape scene – one of their trademarks. See a special card you’d like to own or give as a gift? The Challenge winners and silent auction cards will be framed by High Desert Frameworks! and displayed in Sisters the week of July 7 – 13 ready for bidding. Don’t fancy the silent auction process? Well, each framed card will also have a buy it now price. Reminder: If you didn’t get a chance to submit a fabric postcard for the silent auction or fabric contest, now is your chance. We are still accepting cards to sell until July 1st.